Dragon's Dogma's best features are two parts. First, it's combat, the second, it's pawn system. 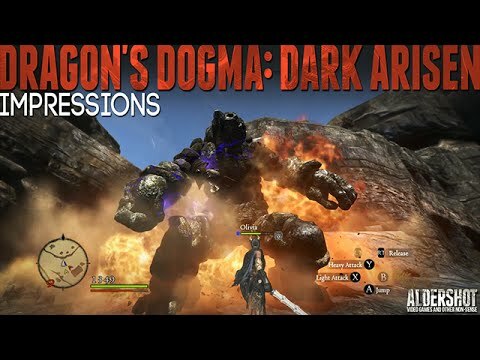 Both unique to Dragon's Dogma alone. What drew me into the game was when I first scaled a giant monster and start swinging attacks at it's head while holding for dear life. Though you won't be doing this all the time, it certainly is a combat feature that stands out. When fighting smaller mobs, the combat plays out similar to games like Dark Souls or Monster Hunter. You'll be using the learned combat skills and spells that you've acquired to wreck havoc on enemies that stands in your way. These skills will drain your stamina bar, so managing regular attacks and special attacks will be key to your survival. The combat overall is very player skill based, but has all the pre-planning of equipment and skill management that people have come to love about RPGs. The ally system, or "Pawn" system of the game is especially interesting. You create your own Pawn, it's appearance, and class, and you'll be able to level it up while setting up it's skills to compliment your desired party make up. The interesting part of this is, that Pawn you designed will be uploaded into the game's server and exported into other people's games. Other players will then hire it and will bring back treasures given to it back into your game, as well as knowledge of quests completed in other people's games. You of course, will also be able to hire other people's pawns into your game. This passive online feature helps create a connection to the greater world of Dragon's Dogma. It's one of the game's most unique features, and in my opinion, one of it's best. As far as equipment, exploration and story is concerned it's pretty average to be honest. The stat and equipment is pretty run of the mill RPG, nothing you haven't seen before. The exploration, though vast in scale, is not nearly as interesting as exploring worlds in other games like Skyrim. The story of the game is pretty forgettable, and certainly was not an aspect that kept me playing. The presentation of the game is acceptable. Keeping in mind, the game was originally released in 2012, the PC port being so late, it definitely shows some age. Compared to more contemporary AAA games, the game's low texture resolution, dated lighting, and lower polygon meshes become very apparent. It's not an ugly game, and still looks great, but it's age definitely shows. Though there is much to love about the game but it's not perfect. The game suffers from a lot of rinse and repeat gameplay loops. So basically there's a lot of repetition and grinding involved. The traversing in the game seem to be inspired from RPGs of old, before quick travel, as quick traveling is something that is earned, and a valuable commodity, rather than a convenience feature that we've grown accustomed to from other open world RPGs. And as mentioned before, the story is very forgettable. Hell, I stopped paying attention to it altogether. Overall, Dragon's Dogma is a great ARPG with a very enjoyable combat system, and an unique party system. Though it's other parts are a little mundane, this is a rare case where the sum of it's parts, is greater than it's whole.